Discussion in 'Soundbars, Soundplates & Soundbases' started by hodg100, Jan 5, 2017. Sony launched three new soundbars at CES 2017. Two are compact yet well appointed models while the other ups the ante with upward firing speakers and Dolby Atmos support. I think it's a bit disappointing that like the Samsung HW-K950 this Sony HT-ST5000 does not mention DTS-HD or DTS-X as supported sound formats. A shame as loads of BluRays use DTS-HD. I wonder why manufactures are leaving DTS out of their £1500 soundbars? Licencing costs perhaps, difficulties storing/operating the requisite software, or just to annoy would-be customers. I find it strange that on the full specs page at sony theres no mention whatsoever of dts format, not even dts 2.0 like the samsung. Hopefully this will support dts-hd. 90% of my bd collection have that format. And altough i have quite a few atmos bds, i still own a couple od bd with dts-x. It's bad enough that 3d was shot dead at ces this year, but i was looking foward for sony to release something to keep my mind of the onkyo ls7200, which support everything you could want. ...for the outrageous asking price is it too much to ask for a pair of wireless (hiss free) rear speakers?! AVSforums has some impression. I like the idea of just one speaker for SS, but is there any way to integrate a soundbar with my existing speakers in my Stereo Setup? I wonder if these will fail as much as their last model. the guy in the above video mentioned it will get a dtsx upgrade bit later on, maybe the are waiting for licensing to come through before they can implement the dtsx inc other dts formats. Oh dts-X support...very interested in this item. Still would like some rear speakers tho. Looks like the Sony HT-ST9 (which costs £1299) with two extra speakers and no DTS support. My HT-ST9 suffered numerous problems with buzzing speakers and a board that failed numerous times plus the bar took an age to power on from cold, now a dead weight a year later. They best have sorted the HW reliability. Shame really as the ST9 had me feeling like l was at the Cinema, i've yet to find a soundbar/sub combo to match it after having returned the Bose SoundTouch 300 and listened to the Yamaha YSP-2700. I want to know what the yamaha 5600 sound projector replacement would be and to see if it will do hdr. I had demo and it sound awesome on mad max fury road atmos.
. Still would like some rear speakers tho. \why the hell would you want to bulk up the 'clean' system. the whole point of a soundbar is one piece to audio hardware. to me, the soundbars that add speakers (vizio 5.1, samsung atmos) are the exceptions (mistakes in my eyes) not the rule. for me, alexa integ would be awsome. yamaha have told me they do not have any new for CES this year and that product launches will be dropped over the course of this year. nothing specific about the 5600 successor even though I specifically asked. of course they wish to keep everything a secret. ...love the uncluttered look of having only a soundbar, but not at the expense of audio quality. 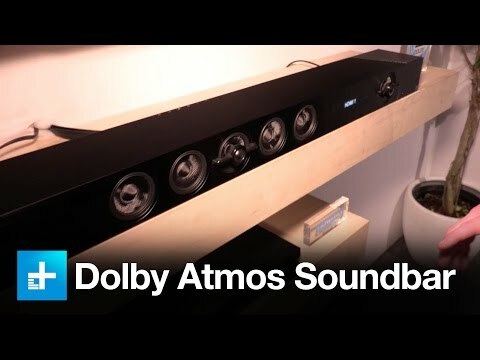 Coming from a 7.2 set up with 4 rear speakers do you honestly think a soundbar magically bouncing audio off walls could give me the same effect? you should try and get a demo of the yamaha 5600 sound projector if you can, I had a demo of it and I have to say was really impressed. It had 44 speakers built in and also seperate subwoofer. Sounded like the sound was coming from all over the room (behind, above etc) but you could not pin point it like with a dedicated speaker system very immersive. I only tested movies and not music do can't comment on that and it was a atmos demo and normal dts not dtsx. I will consider it for my next upgrade as you do away with an amp, speakers and wiring. I don't think having 2 wireless rear speakers which can be mounted on the rear wall out of the way is very inconvenient for anyone. I think the benefits of improved sound easily justify it. i'd love to get my hand on a 5600 plus. but this model is not out yet .